You can buy good books about balloon modelling online --- just click on the cover. New record claims are welcome. Please send an e-mail to info@recordholders.org BEFORE your record attempt. 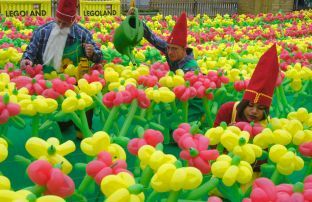 The record is for the greatest amount of completed balloon sculptures to be made in 1 hour. All balloon shapes must touch the table in order to count. If the shapes pops or deflates before touching the table, it does not count. The attempt must be rigidly timed and videotaped with a clock in the background. There should also be 4 personnel present, 2 counters, 1 judge and a timekeeper. No-else should be around the table. The final figure needs to be verified by the judge, then signed by all personnel present at the table. The record is for modelling 100 standard animals (well known as "dogs", see image) as fast as possible. The proportions of the animal can vary. However, both ears and all legs should have approximately the same size. The figure must have 10 bubbles (incl. tail). for the records with "balloons already inflated": Before the record attempt starts, the record breaker can inflate as many balloons as he/she wants. The time for inflating the balloons does NOT count for the record. For the records with "inflating by mouth": All balloons must be blown up by mouth. No artificial means may be used (pumps, compressors etc.) The time it takes to inflate the balloons is a part of the total time. The stop watch will be stopped when 100 animals are made. 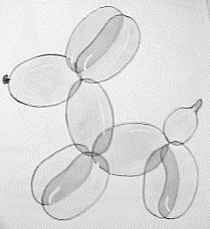 If a balloon animal looses its shape before touching the table, you have the choice: You can restore it or you can use another balloon instead. If a balloon bursts, you must use another one. as Quicktime movie (1,8 MB) or AVI (2 MB). 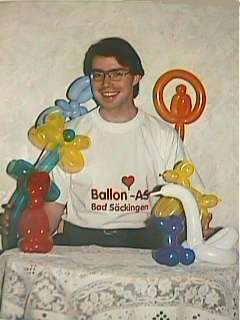 These records are for modelling as many balloon animals as possible within 3 / 6 / 10 / 24 hours. All balloons must be blown up with OWN LUNG POWER. The time for inflating the balloons is a part of the record time. If a balloon pops or deflates while you are twisting it, it does not count. You must use another one. Read more about balloon modelling at balloonhq.com. and balloon411.weebly.com.